British artist Tony O’Connell documents the sacred side of queer people and places. He takes photos of saintly moments among ordinary LGBT people and records his own pilgrimages to LGBT historical sites. “My initial idea was an attempt to reclaim the idea of holiness as a gay artist,” O’Connell says. Based in Liverpool, he was raised in the Roman Catholic tradition, but has been a practicing Buddhist since 1995. “The intention was to democratize the notion of sacredness and the process of canonization. We do not need the permission of anyone else to see perfection in each other,” he explains. Since 1998 he has been photographing people with haloes formed by round objects from daily life: light fixtures, mirrors, windows, baskets, the sun -- and even life ring buoys. “The act of noticing the moment where a physical circle as a symbol of a halo was present is an artistic parallel to noticing those qualities in the real people themselves,” O’Connell says. 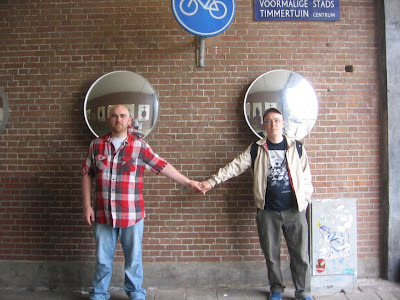 He started with portraits of himself with haloes, and then expanded to his partner and LGBT friends. 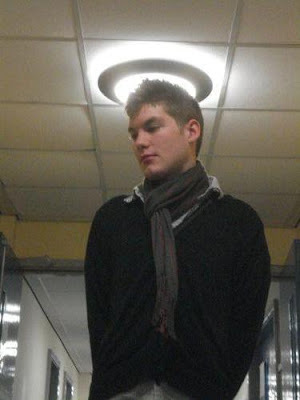 Eventually he included straight allies and strangers as he took the halo concept to its logical conclusion. “The images are just examples of something that is present in them, in you, in me and in all,” he explains. None of the saints in his photos have been recognized by the church yet. 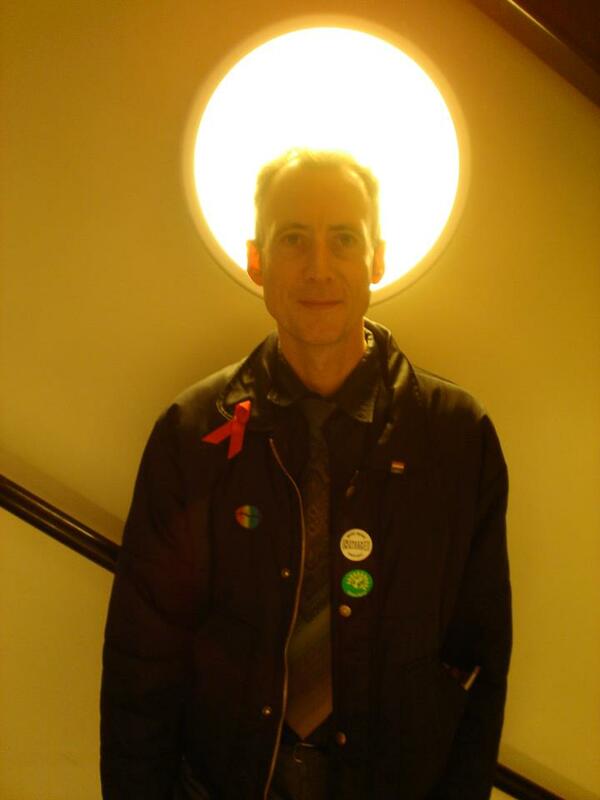 But O’Connell did convince famous LGBT activist Peter Tatchell to pose for a quick halo portrait after a lecture on the plight of LGBT people in Iraq. In 2008 O’Connell began displaying the saint photos in churches and other small venues at exhibitions named “Perfectly Ordinary” and “Be in that Number.” Some churches complemented the images with Gregorian chants playing in the background and frankincense fragrance in the air. O’Connell’s saint photos will be shown in America at the “Sacred Voices” exhibit at the Canton Museum of Art in Canton, Ohio from Dec. 5, 2013 to March 2, 2014. It features contemporary Christian, Jewish, and Muslim artists who are seeking to express their faith through their art. 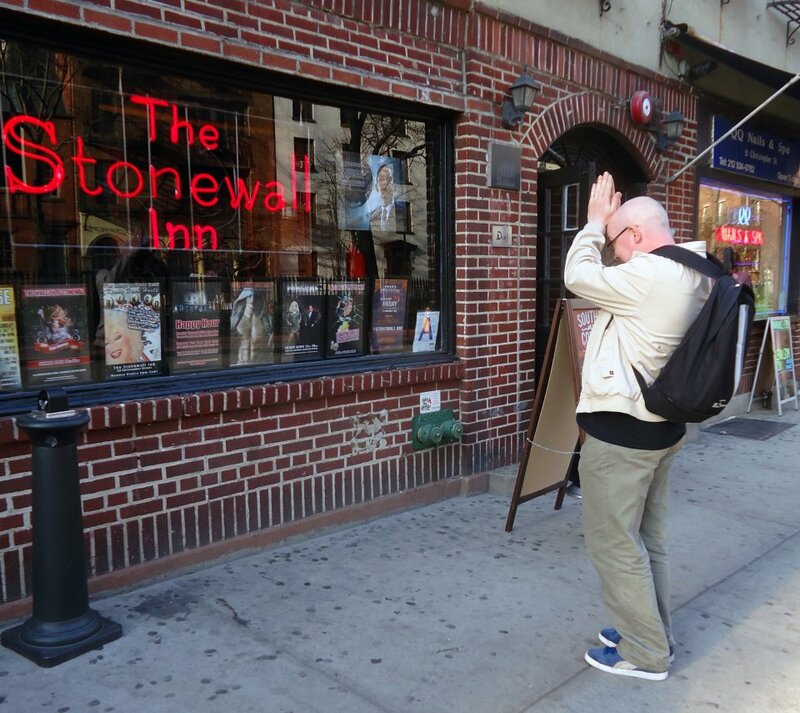 “Prostrations at the Holy Places and Veneration to Our Martyrs (Stonewall Pilgrimage)” by Tony O’Connell shows the artist praying at the bar where the LGBT rights movement began. 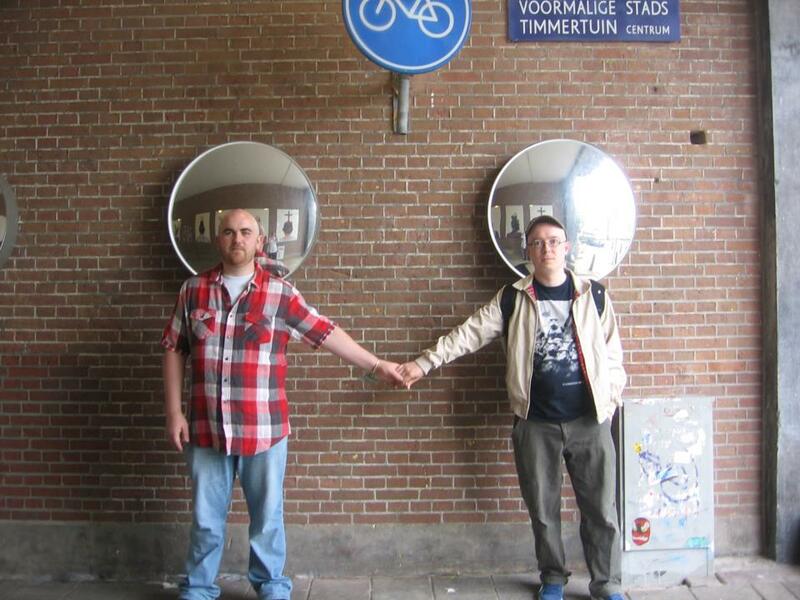 Recently O’Connell began a new series on LGBT pilgrimages, which he does as performances recorded in photos. He travels to places of importance in LGBT history, treating the trip as a pilgrimage to the shrine of a saint. His first pilgrimage led to the San Francisco Metro station named after slain gay rights leader Harvey Milk. “The traditional Buddhist offerings for saints and Bodhisattvas are water, food, perfume, incense and flowers so I took them to his shrine and made prostrations,” O’Connell said. Earlier this year he made a pilgrimage to New York City's Stonewall Inn, where rebellion against police harassment in 1969 launched the modern LGBT liberation movement. His next destination is Manchester, England. He plans to leave offerings on a memorial bench there dedicated Alan Turing, a gay computer scientist driven to suicide by attempts to “cure” his homosexuality. In the future O’Connell plans to do icons as tributes to well known LGBT figures such as Milk, Turing and AIDS activist Larry Kramer. The following images are selected from more than 200 saint photos taken by O’Connell. All of the saints in these pictures are openly lesbian, gay, bisexual or transgender. While the artist’s ultimate purpose is to show that sainthood is non-exclusive, the Jesus in Love Blog is highlighting only LGBT saints here in order to balance centuries of religious oppression against queer people. “Saint Antoinette Who Comforts the Sorrowful and Gives Courage” by Tony O’Connell honors a caring friend. Saint Antoinette and her partner Saint Lindsay helped the artist through the grief of losing his mother. “Liberated Being (Saint Tony Travels to the Land of the Free)” by Tony O’Connell is a self-portrait of the artist on the way to Ellis Island. 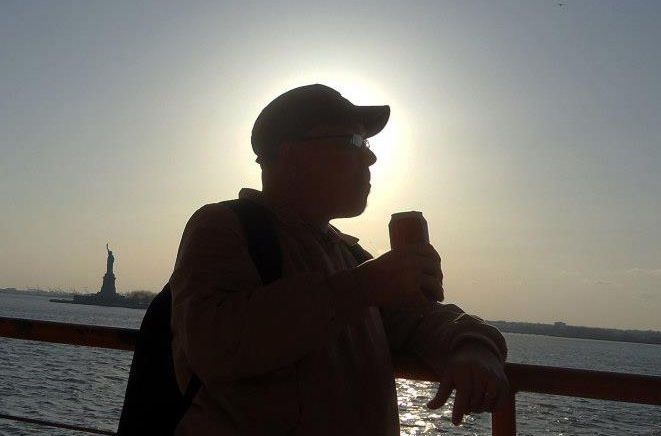 He stands back-to-back with another liberated being in the distance: The Statue of Liberty. 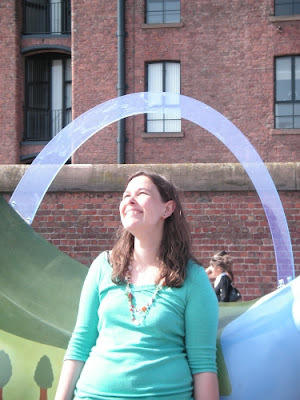 “Saint Lindsay Filled with Joy by a Vision of the Rainbow Covenant with Heaven” by Tony O’Connell shows a friend who chose her own halo for this portrait on the waterfront in Liverpool. “Saint Kevin and Saint Tony on the Feast of Sergius and Bacchus” by Tony O’Connell shows the artist on the right with his partner Kevin. It is one of his rare diptych images of paired saints. The double-halo composition echoes a 7th-century icon of Saints Sergius and Bacchus. Traditional and alternative saints, martyrs, mystics, prophets, witnesses, heroes, holy people, humanitarians, deities and religious figures of special interest to lesbian, gay, bisexual and transgender (LGBT) and queer people and our allies are covered in the GLBT Saints series by Kittredge Cherry. What an absolutely terrific idea, and a great blog about it! Thanks for sharing this! Trudie and Anne, I'm glad to hear that you share my appreciation for Tony's photos... both the concept and the execution. He's an up-and-coming artist so I look forward to seeing and sharing more of his art in the future. i love this. this is so beautiful. To find a clear vision of that which one's artistry is about is to find life and creativity. I resonate with the comment: "We do not need the permission of anyone else to see perfection in each other.” And whether we seek it or not, support given and received is a gracious part of that process. Tony, you have my appreciation and support for your work and your sharing. I just want to say that I am really grateful for this level of support in the saints project I am developing. 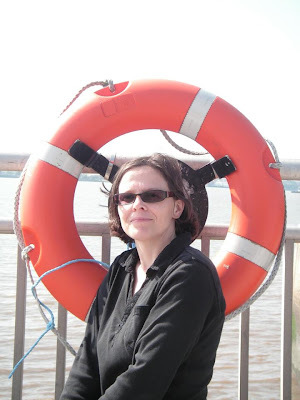 I am developing further strands of spiritually focused LGBT work which I will send images of as it happens. Bless your kindness and energy and thanks to your readers for their interest. I love the idea of democratizing the canonization of saints. Never thought of it that way before. Great pictures! I’m delighted to get so many comments from those who appreciate this art -- and one from the artist himself. The creative process can be lonely, especially for people working with LGBT Christian themes, and I feel blessed to be able to create a space that nurtures this important work. Eric, thanks for sharing your artwork here as well as your comments. Jendi, the many ways you support my efforts help make this possible.